Collecting Sticks is the perfect showcase offering for the singular talents of this most distinctive practitioners of autobio comics. 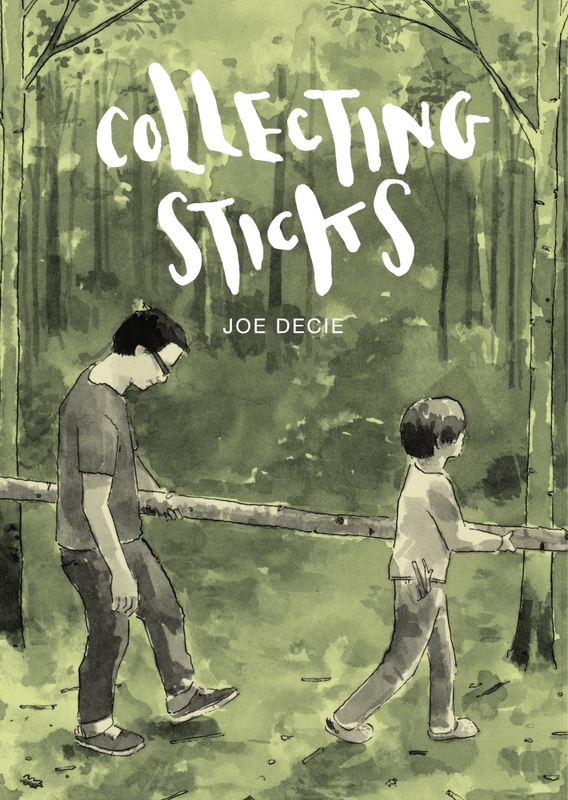 I will confess to never having heard the term “glamping” before I read Joe Decie’s latest offering Collecting Sticks, published this month by Jonathan Cape. If you’re similarly ignorant of its meaning it’s a conflation of “glamorous” and “camping” – two words whose placement together in the same sentence is so incongruous that it would seem a positive celebration of the phrase “contradiction in terms”. 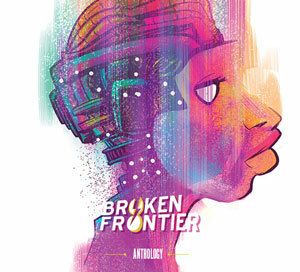 Joe Decie’s work has been oft-featured here at Broken Frontier over the years. From The Accidental Salad and The Listening Agent (both published by Blank Slate Books) to self-published work like There’s No Bath in this Bathroom and his numerous anthology/micropublisher contributions, his curious fusion of everyday autobiography with the wildest flights of fancy has garnered him consistent critical acclaim. 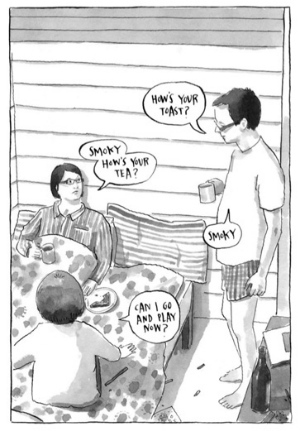 Much of the slice-of-life humour revolves around the family dynamics. 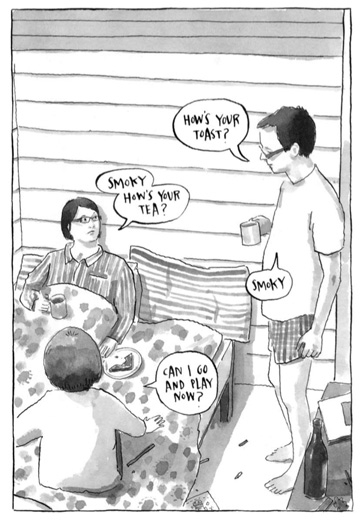 Joe and Sam’s forays into the surrounding environs leave the reader wondering which of them is actually in charge of the other; while the pragmatic Steph remains their imperturbable guiding force. The three of them embark on this back-to-nature odyssey of discovery punctuated by the constancy of canine excrement and Joe’s frequent fixations on his OCD fears (“I might just ring my mum. Get her to pop round, check I’ve turned the taps off”). Long-time Decie aficionados, however, will be looking for those tangential sidesteps. And the moments where reality merges into Joe’s sudden stream-of-consciousness reveries don’t take long to arrive – using Dungeons and Dragons dice for directions in lieu of a satnav; ruminating on the symbiotic life cycle of your favourite stickers and the household items they’re stuck on; drifting off into punchline-challenged drinking anecdotes; and working out the odds on the laundry being eaten by a bear are just a few choice examples. 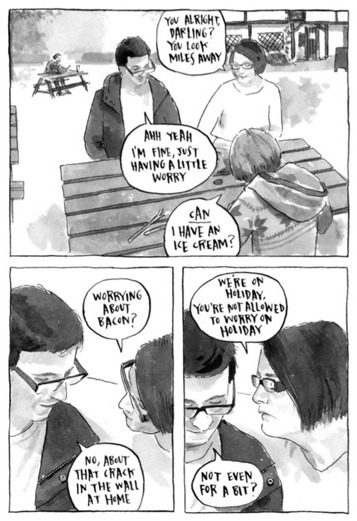 As ever Decie’s comic timing is impeccable with his build-up to his near surreal punchlines always quietly inspired in delivery, and his ever self-deprecating commentary (on worrying: “It’s easy. I’m an expert at it. You should give it a try. Stop reading this for a bit, and have a go, have a worry”) strangely seductive in tone. 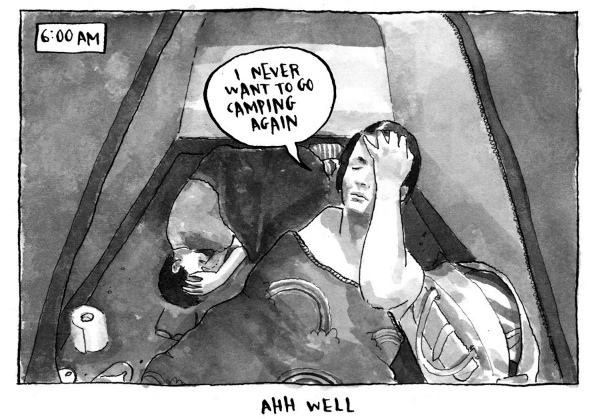 His ink-wash visual style perfectly complements both of the worlds his comics inhabit. 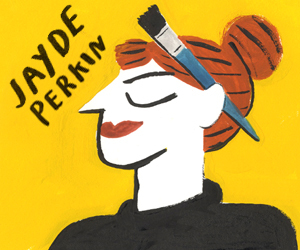 Its mix of realism and melting dreaminess anchoring it in both storytelling realms from the mundane to the fantastical. It’s all too easy to get sucked into Joe Decie’s trademark rambling, understated and dismissive on-page persona and allow yourself to become blasé about the confidence in technique and visual storytelling on show in every page of his work. 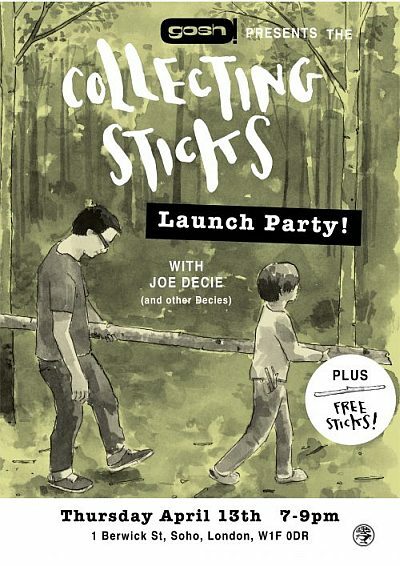 Collecting Sticks is the perfect showcase offering for the singular talents of this most distinctive practitioner of autobio comics. Collecting Sticks launches at London’s Gosh! 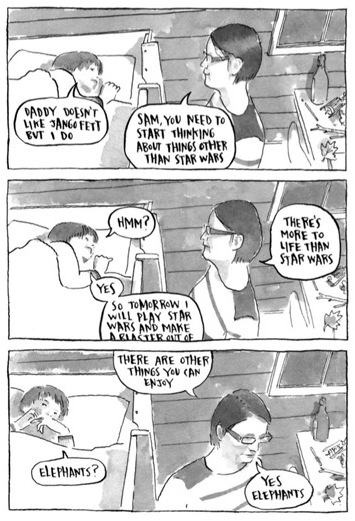 Comics this Thursday April 13th. Details on the Gosh site here. Staff Picks for May 24, 2017 – Livestock, On the Camino, The Normals, Your Black Friend and More!